Hasay and Tebo head back to San Diego. 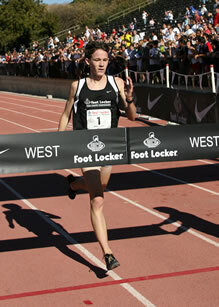 Walnut, Calif., December 2, 2006 – Matt Tebo of Albuquerque, N.M., and Jordan Hasay of Arroyo Grande, Calif., won the Foot Locker Cross Country Championships (FLCCC) West Regional at Mount San Antonio College (Mt. SAC) in Walnut, Calif., today. In the boys' race, a pack of eleven runners ran a fast pace led by Tebo and Chad Hall of Big Bear Lake , Calif. At the two-mile mark, the remaining pack of runners was down to six until the finish. With 300 meters remaining, Tebo and Hall, along with Jake Riley of Bellingham , Wash. , and Mikel Thomas of Clovis , Calif. , were battling for the coveted regional title. Tebo, a two-time FLCCC national qualifier, finally opened up the lead in the last 50 meters to win the race in 15:46 . Hall, a senior at Big Bear High School , finished second in 15:47 , with Riley, a senior at Sehome High School , placing third in 15:48. The girls' race became a duel between last year's national champion Jordan Hasay and four-time national qualifier Marie Lawrence. The two runners opened up a large gap at the midway point and never looked back. Reaching the last half-mile, Hasay made her move, opening up the lead and pulling away in the last 300 meters to win the race in 17:43 . Hasay, a two-time FLCCC national qualifier, won last year's West Regional race as a freshman and was crowned the 2005 FLCCC National Finals champion one week later. Lawrence, who finished second in 17:55 , will return to the Finals to compete for the National title for the fourth and final time. Lawrence, a senior from Reno High School in Reno , Nev. , won the West Regional in 2004 and has come in second place in the FLCCC National Finals the past three years. Jessica Tonn, a freshman at Xavier College Preparatory in Scottsdale , Ariz. , finished third in 18:24 . The runners enjoyed good racing conditions, competing on a dry, fast course with temperatures in the mid-70's. The top eight boys and top eight girls from the FLCCC West Regional qualified for the FLCCC National Finals, with the remaining two spots for the top finishers from the Foot Locker West region at the Nike Team Nationals (NTN). A total of 10 boys and 10 girls from the West Regional will compete against runners from the Midwest , South, and Northeast Regional meets in the 28 th Annual Foot Locker Cross Country Championships National Finals, which will take place on Saturday, Dec. 9 at Balboa Park in San Diego , Calif.
Mount San Antonio College – Walnut, Calif.